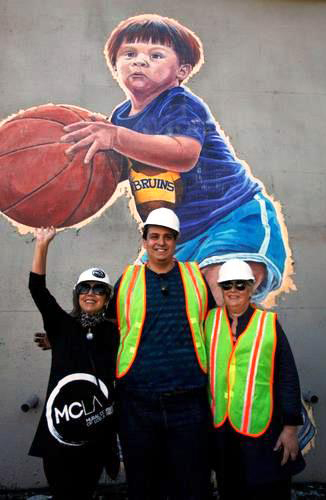 You may not know the name Glenna Avila (pictured left), but she created one of the most iconic L.A. murals in the city’s history in addition to guiding the production of nearly one hundred murals working with and eventually taking over for Judy Baca in the city-wide mural program. 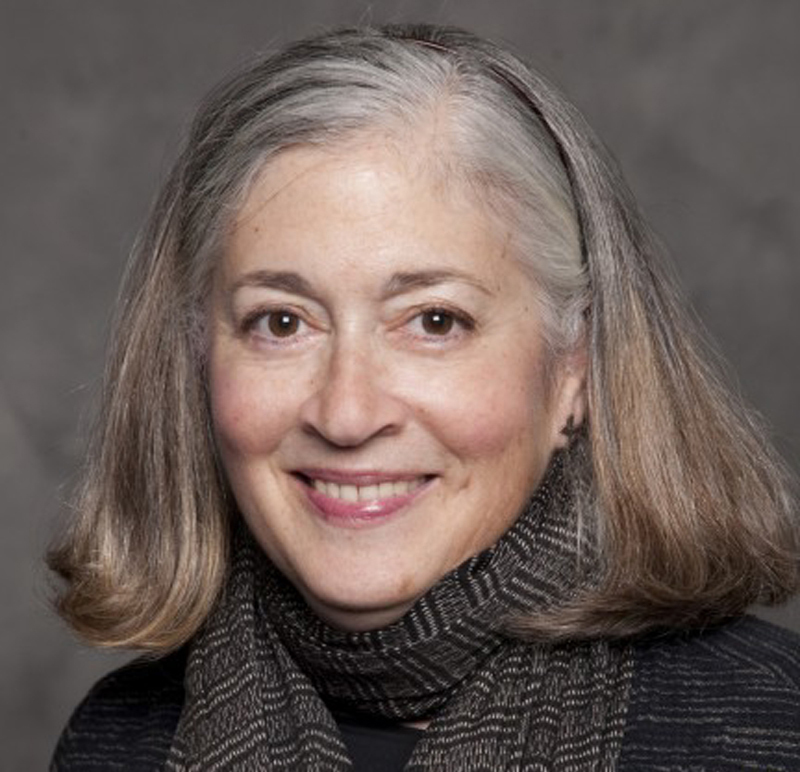 She continues to foster creativity in young people as director of the Cal Arts Community Arts Partnership program. We met at Self-Help Graphics where CAP students were working on self-portraits, prints and film projects. Like clockwork, we were interrupted every few minutes as students, teachers and friends stopped by to say hello, ask a question or give her a hug. Pancho Lipschitz: What part of L. A. did you grow up in? Glenna Avila: When I was born my family was living in Hollywood. My dad is a musician and he was playing in the studios, but when my brother was born he had severe asthma and the doctor told my parents we should move to the ocean because the air was cleaner. So we moved to an apartment where the 10 freeway is now. But my dad was born in Boyle Heights, so I always felt a connection. PL: What is your first memory of reacting to some form of art? GA: Going to see my dad perform. He was performing in Aida at the Shrine Auditorium and he was dressed on stage in tights and he was playing a really long trumpet with flags hanging off it because it was supposed to be medieval. I think I was three. PL: I know you went to UCLA in the ’70s. What was that experience like? GA: It wasn’t my first choice for art school. I wanted to go to Cal Arts but even then I couldn’t afford it. The UCLA art department at that time wasn’t what I wanted it to be. I was a little more forward thinking about contemporary art, conceptual art and it was much more of an academic art school. But I got good academic training that later I was able to draw upon. PL: How did you know about conceptual art? GA: My best friend growing up, her parents were contemporary art collectors so I was familiar with all of the cutting edge art that was being created all over the world. I met this friend of mine at UCLA and he said why don’t we create a program where we bring different artists to UCLA. So we brought people like Lawrence Weiner, Joseph Kosuth, Vitto Acconci, Yvonne Reiner, just a bunch of great artists. And since we were the organizers not only did we get to hear them speak but they either stayed at our house or we got to have dinner with them. For me it was just mind blowing because I didn’t know that you could just write to somebody famous and then have them come and meet you. PL: What was your grad school experience like? GA: I went to the University of New Mexico basically because I loved New Mexico. Using the UCLA experience I started a program at UNM to bring artists like Hans Haacke. I do remember when I put up my exhibition the chair of the department coming in and saying, ‘We’re giving a degree for this?’ I basically had written a manifesto about conceptual art and that was part of my exhibition. It was the first time I had sort of been called a trouble maker and I thought, ‘I kind of like that’. PL: Are murals your way of avoiding the art market? GA: Well when I was at UNM my best friend there was also painting murals. So one day I went with her to this elementary school in Albuquerque and she was there with the kids painting this mural and a light bulb went off for me. This is how you combine art, politics, community, education, working with kids AND nobody can buy it, it’s not a commodity, it’s a gift to the community not something that can be owned by people who have the wherewithal to buy it. So when I left Albuquerque and came back to L.A. I ended up seeing that there was a job with Judy Baca in the city-wide murals program as an art instructor and I got it. I learned so much and I started putting that academic painting education into practice. PL: In the art world conceptual art is when you fill a room with jelly beans, not painting a community mural. GA: I’ve always felt that community art is the most radical, the most conceptual, the most high art actually. It’s much more difficult to go into a community and work with people to create a piece of art than it is to go into your studio and create a piece of art. PL: I read that you oversaw a mural project with John Valadez and Carlos Almaraz. GA: The mural was a great mishmash of their styles and visions. I think in the end it came out more of John Valadez’ style than Carlos’, but Carlos had an influence over some of the content. Carlos had just come back from visiting the Yucatan, he had visited a lot of Mayan temples and there was one that was the observatory and he wanted to put that into the mural. So he put that on one end and then John painted all the kids running towards it. It was almost like a spaceship kind of thing. And then you had things flying in the sky and I always thought the things floating in the sky were tortillas because I had seen the Los Four show at LACMA in ’74 and loved the tortillas with glitter and the tortillas with paint but John Valadez said he thought they were potato chips. So when all the kids were painting John and Carlos would stand in the street having these huge discussions about art and arguing back and forth and the kids were like, what’s going on? I didn’t hear the arguments I just tried to keep the kids focused on painting. PL: Of course I have to ask about the L.A. Freeway Kids 1984 Olympics mural. GA: Alonzo Davis had the idea to create a corridor of murals during the Olympics. I didn’t want to do something that was literally related to the Olympics. I was more interested in the diversity of L.A. and I was interested in kids and how kids aren’t really a part of the Olympics. So I wanted to do something honoring young people and what kids do athletically. PL: And what was it like to see it restored? Glenna Avila is the Artistic Director of the Community Arts Partnership (CAP) program at Cal Arts. Pancho Lipschitz is a barrio flaneur and a barrio flan connoisseur.